The past week has been a mixture of highs and lows. I’ve made good progress, got some important visas, but Gambia was hard because I encountered so much tourist hassle. 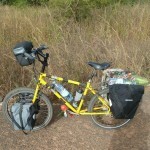 The repair to my seat post survived the dirt roads south of Kaolack. 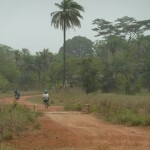 The villages south of Kaolack on the way to Sokone seemed more traditional compared to those I’d passed previously. There was much less litter, more thatched huts/houses, less begging from children, although they still seemed to get very excited, shouting ‘toubab! toubab!’ at me and waving wildly as I passed. 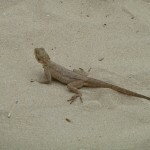 I spent a great day relaxing at Toubakouta, camped and eating grilled Baracuda. I couldnt have left much sooner, I didn’t plan properly and would have arrived in Banjul at the weekend (needing to get a visa for Sierra Leone, but the embasy only opens weekdays). I crossed the border to The Gambia at Karang, nice and easy, no problems, but lots of hassle from money changers. I’ve not had any trouble leaving my bike. There is always a guard sat outside who I ask to keep an eye on it. 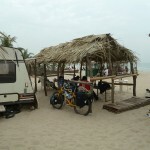 Soon after arriving in The Gambia I met what my guidebook calls Bumsters! Young men looking for a wife from Europe, I assume for the opportunity to live in Europe and all the advantages it brings. They showed me photos of one of their friends who’d married an older woman from my home town in England! I couldnt believe it, they had a postcard from her with local sights from where I grew up. I had no idea that this sort of thing happened so close to home. Later I saw a newspaper headline that read “UK Authorities Stop ‘Shame Marriage'”. I think the message got lost in translation somewhere! 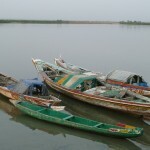 I crossed the river to Banjul early in the morning from Barra. The ferry was very very slow and beltched out horrible fumes. I heard from someone that it is an old Dutch ferry from the 70s! The exit ramp at the Banjul end was lowered by driving a truck onto it! 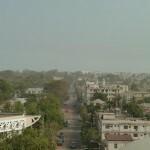 Banjul wasn’t much fun. Far far too much hassle from men on the street, children begging and ‘guides’ in the place I stayed. I felt hounded everywhere I went. I didn’t like Banjul, but I got my Sierra Leone visa easily from the embasy. 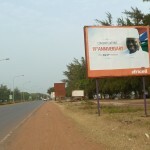 Leaving Banjul, I kept seeing billboards congratulating the president on his 19th year in office (after a military coup). The billboards were all from Africell, the local phone company. I saw grafiti that said “We support Jammeh, our town is 100% Jammeh, president for life”! There were cafes called “22nd July Cafe”, the date of the millitary coup in 1994. This is the first time I’ve travelled in a country with long term millitary rule, I found it a very strange experience. I’d recommend looking up recent Gambian politics, they recently withdrew from the commonwealth after criticism over human rights abuses from the UK. I sayed in Sanyang for a night with some people my sister knows. The sense of hassle continued, I felt hounded for money with them asking me to lend them money and that they’d pay me back the next day. I didn’t enjoy The Gambia. I hoped that Sanyang would be a place where I felt at ease, but found that I couldn’t let my guard down. I really wanted to get out of The Gambia ASAP. I have no idea how it is such a popular tourist destination. 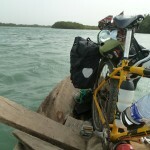 I crossed back into Senegal at Kartung where I crossed the border in a dugout canoe. For anyone considering doing this… don’t! I got stamped out from The Gambia OK, but there was no imigration post on the other side of the river in Senegal. Just a 10km sandy track to the paved road, no imigration point in the next town, then a 15km ride to the border point I should have used originally at Seleti. They stamped me in without any questions, I’m not sure they realised I arrived from the wrong direction, I have no idea if it was ok for me to be in Senegal for half a day with no entry stamp! 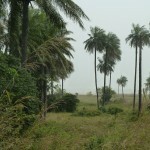 The Cassamance region of Senegal has been really great. The people are friendly and happy to chat. The landscape is a mixture of lush forest, deltas and farmed wetland. And I can get my favourite La Gazelle Ananas drink! I’ve not had any trouble with animals apart from on one occasion when I saw a pack of about 20 dogs in the road… but as I approached it turned out to be just some monkeys! They scattered into the trees very quickly as I got closer, no problem! I’ve been warned about bandits on the road at night in Casamance, but apparently the roads are safe in the day. There are military checkpoints at each town and in some villages. I understand that there was a huge problem with a separatist movement 10 years ago, it is mostly resolved now but has left a legacy of criminality. However I feel safe here, especially in the towns, but in the countryside too. I’m now in Ziguinchor at a hotel. 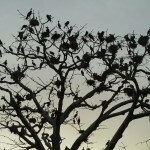 There is a huge tree outside with hundreds of noisy storks in! Zig is a great town, nice and relaxed, lots of shops and restaurants, and really in the middle of a stunning region of Senegal. It’d make a great holiday destination. I’ve heard that there is an overnight ferry from Dakar, I think it would make for a good trip. I managed to get my Guinea Bissau visa today after spending an hour looking for the consulate. It’s moved out of town and I had to ask for directions many times to find it, people kept sending me back to the old location! Very easy application, they even filled in the form for me! Just a copy of my passport required. 20,000 CFA paid in cash. Prices posted on the door. 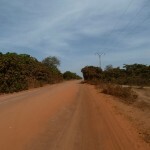 Tomorrow I’m heading for the border at Sao Domingos in Guinea Bissau. I’ve heard that there is a carnival/festival from 24th Dec for one week in Bissau. I should be there by then. I’m looking forward to it. This entry was posted in Uncategorized, West Africa on December 20, 2013 by Matt. Don’t go near the monkeys! They’ll steal all your stuff. Have a good Christmas Matt. Hi Matt Liked the Stork pictures not sure they are storks though. Hope you are getting loads of pictures. It is Christmas eve here and there hope yoy have a good Christmas day. Will be thinking of you in the sunshine. Thanks everyone. 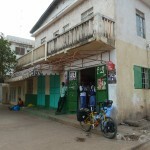 I’m in Bissau now, raced to get to the Guinean embasy here for my visa before it closes for Christmas. All OK though, just took a couple of hours waiting and I got it. It’s warm here, in the shade it’s 30°C, put the thermometer in the sun and it’s 50°C! I’d expected poverty in Guinea Bissau, but I’d not expected the huge divide between the visible wealth in Bissau city and the complete poverty of the countryside. I stayed with a German expat anarchist and round the world motorcyclist traveller in Sao Domingos for a couple of nights. Helped out training his youth football team, called Africa United…! 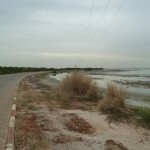 The people here are very friendly and I really like Bissau. Glad you’ve found somewhere you like. Hope you have a great Xmas Day.. I’m sure you won’t be eating turkey and sprouts! Take care and Merry Xmas!